As I prepare to head to France next week with my 20 year old son, I am thinking back to my first trip to Europe (this is not his first trip over the pond) – I was 19 and went with my parents to Germany, France, Austria, Switzerland, and Italy. 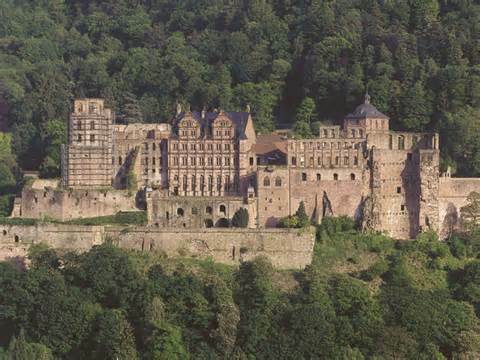 It was a super cool time and one of my favorite memories was Heidelberg Castle in Germany. It overlooks the city and down to the river. It’s a romantic place even though some of the place is in ruins. Here’s a link to a cool website with some pictures if you want to check it out. My scanner is on the fritz at home or I’d scan a photo or two of my own. One fun thing about the castle is the famous wine vat (tun) in the cellar. It’s massive. It would hold over 57,000 gallons of wine if it was in use as a wine vat but it’s not currently used for that. It’s basically a tourist attraction. I know I’ve said it before but I love Friday Facts. The website you link us too is a story in pictures. So many beautiful but the destruction is hard to take. How men can destroy history and beauty is beyond me. Thanks for another great fact. You should def. head over and check it out. I love Germany. Lots of lovely castles. Where did you live? Near Wurzburg, in a town called Kitzingen. Sort of central south Germany. Military at the time, but I think they’ve closed that base.